Find Halloween crafts, Halloween fun craft projects and Halloween crafts for kids here. Halloween crafts are suitable for children of all ages. They are easy to prepare, which the kids can make at home, during a Halloween party, with their classmates at school, or with their scout troop. Making the craft does not require too much preparation and is a fun activity to indulge in. The best thing about Halloween crafts are that these projects use materials found around the house, such as egg cartons, cardboard, paper, boxes, string, crayons, paint, glue, etc. Halloween crafts can be scary, at the same time, a lot of fun. These crafts are affordable enough, but some of them may require a bit of adult supervision too. Halloween crafts can be used to change the look of an individual or a place. For example, a young girl can dress up in Stephanie costume, while box town can be enlarged to give your place the look of a haunted home, easily. Make use of Halloween colors including black and orange, for the handmade candles. Use Sherlock Holmes hat and stuffed white snake as accessories and props for your Halloween costume party. Some of the popular Halloween crafts are box town for children, handmade candles, jack o lantern pumpkin carving, Sherlock Holmes hat, Stephanie Halloween costume and stuffed white snake. 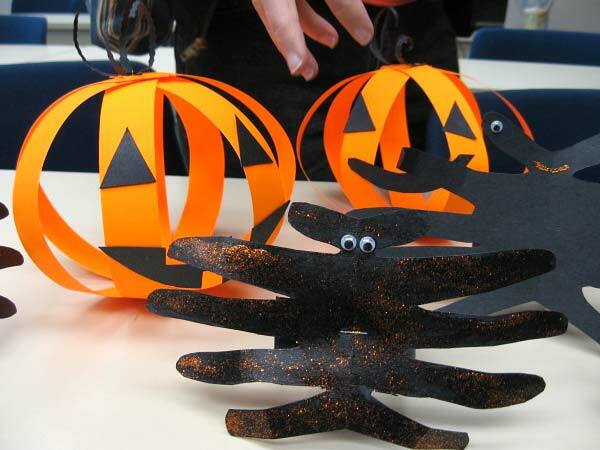 In this section, we have given the information on making the bizarre and fun Halloween crafts. Working with wax as a hobby can be fun and can be profitable, as they can make beautiful, yet inexpensive gifts. Candle making is not difficult for a beginner to learn. It only requires little creativity. You can anytime melt the wax down and start over, for this craft. There are varied kits for candle making available in market, which you can even use for making your candles. If it is Father's Day or your brother's birthday and you want to gift him something different this time, then the idea of making a crochet hat, just like one that Sherlock Holmes used to wear, seems to be quite impressive. Making the hat requires some basic stitches, such as chain stitch, slipstitch, single crochet and double crochet.